ENSINGER Penn Fibre is your best source for plastic washers and punched or stamped/cut plastic parts from .005” to .125” thick. Supplied in engineering and high performance plastics and non metallic materials. Washer O.D.’s Range from .062” to 4.5”, I.D’s from .046” to 3.5”. We stock master plastic rolls and have over 4000 die sets available – so we can punch and ship most orders in four-10 days. Custom materials and large quantities in about two weeks. To visit our Performance Punched Parts website Click Here. 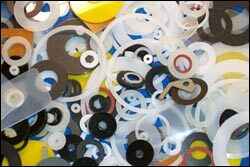 All plastic washers and punched parts are supplied on a custom order basis. 4,000 Die Sets (O.D.’s & I.D.’s) are on hand. Tooling charges apply – if a die must be built. O.D’s available from .090” to 4.40”. I.D.’s available from .062” to 3.90”. Tolerances - as quoted or to customer specifications.